“Mission: Impossible” was a 1996 film based on the sixties spy television show of the same name. Paramount Pictures originally approached U2 about working on a theme song for the film, but the band was just about to reassemble to work on the “Pop” album. Adam Clayton explains why U2 would turn the project down: “It seemed like the last thing the band wanted to do, as we were about to start focusing in on our own music and start scheduling our own record. We said no, because these things tend to take up more time than you could imagine. At the same time, everyone was excited about this great tune. Then I thought about it. There’s always a bit of hanging around while we make a U2 record, and it is an instrumental, so maybe it was something Larry and I could so. So we went ahead. Mission: Impossible is such a great tune that we thought we’d try to do an updated version, and think of it more as something that would work in clubs rather than something that would promote a movie.” Larry Mullen and Adam Clayton would produce two versions of the theme song for the soundtrack, and it was also released as a single with additional mixes of the two tracks. A wide variety of promotional releases were also issued to support the single and the soundtrack album. Adam and Larry being in different parts of the world, started work on the track individually. They brought both working tracks back to Paramount hoping for some direction on which to finish, and Paramount requested that they finish both. The remainder of both tracks was worked on together. Recording took place in various locations, including Dublin, recording with an orchestra in London, and some work with a percussion player in New York. Both versions of the track appear on the soundtrack album, and they both are remixed and appear in multiple versions on these promotional releases. A video was produced for “Theme from Mission: Impossible” which featured scenes from the movie playing in a room full of televisions cut with close up shots of Adam Clayton and Larry Mullen performing the song. We also see “mug shots” of Adam and Larry being analysed by computer. Throughout the video Larry and Adam are lit in blue and red, in reference to the blue and red wires typically used in creating an explosive. The single was released in multiple formats, including a variety of 12-Inch records, cassette, and 5-Inch CD. The promotional release also included a variety of vinyl releases both on 7-Inch and 12-Inch as well as a variety of CD releases for promotion. Information on which tracks appeared on which versions of the single can be found below in the catalog section of the site. Some sources have listed the version on the 7-Inch juke box promotional single as a “7” Edit” but it is the 3:27 version of the title track, not a new edit. Performed by Larry Mullen and Adam Clayton. Produced and arranged by Larry Mullen with David Beal. Remixed by Junior Vasquez. Performed by Larry Mullen and Adam Clayton. Produced and arranged by Larry Mullen with David Beal. Post production and mix by Junior Vasquez. Mix engineer: P. Dennis Mitchell. Programming: Joe Hoskowitz. Performed by Adam Clayton and Larry Mullen. Produced and arranged by Howie B.
Remixed by Goldie and Rob Playford at Manic One Studio. Performed by Adam Clayton and Larry Mullen. Produced and arranged by Howie B.
Remixed by Dave Clarke. Performed by Adam Clayton and Larry Mullen. Produced by Howie B.
Remixed by Guru for Guru productions. Performed by Larry Mullen and Adam Clayton. Produced and arranged by Larry Mullen with David Beal. 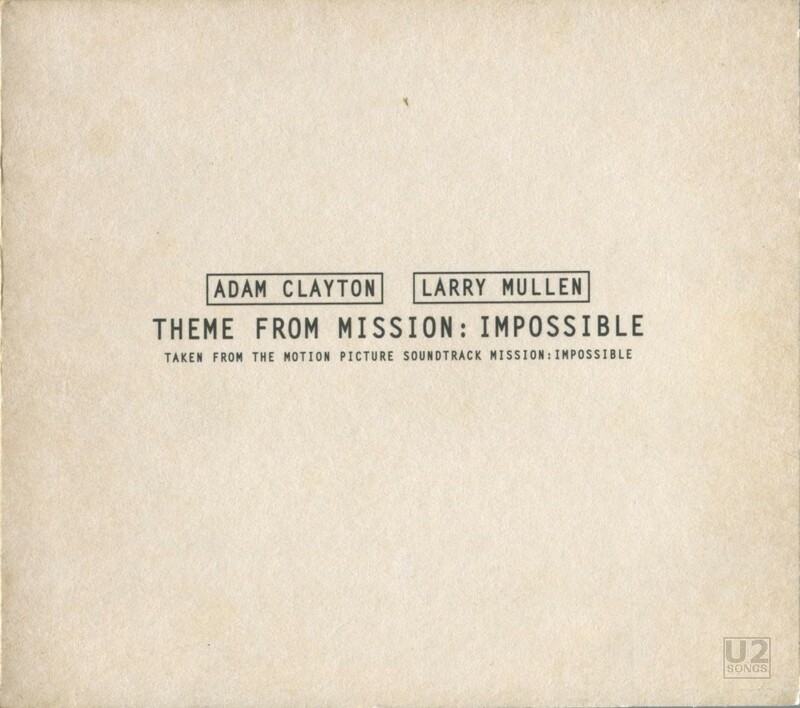 Sample from the original television soundtrack recording of “Mission: Impossible Theme” conducted by Lalo Schifrin. Dialogue “This tape will self destruct…” spoken by Henry Czerny. Remaining dialogue spoken by Junior Vasquez.